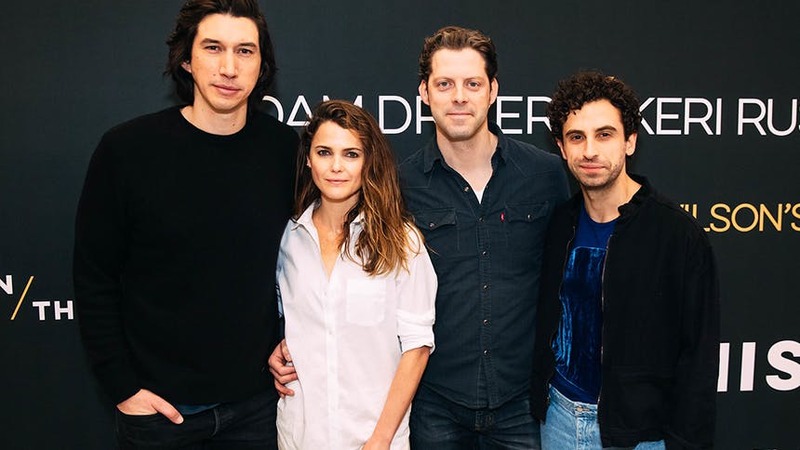 Emmy nominee Keri Russell makes her Broadway debut leading the first Broadway revival Lanford Wilson’s Burn This alongside some heavy-hitting stage actors, Oscar nominee Adam Driver, two-time Tony nominee Brandon Uranowitz, and Tony nominee David Furr. Scroll on as BroadwayBox looks back on the New York stage credits of the Burn This guys. Before finding screen fame on HBO’s Girls and the Star Wars franchise, Adam Driver made his New York stage debut in 2009 as part of Playwrights Horizon’s production of The Retributionists and the following spring appeared in Classic Stage Company’s The Forest. He made his Broadway debut in October 2010 as Frank Gardner in Roundabout Theatre Company’s revival of Mrs. Warren’s Profession opposite Cherry Jones. Then in early 2011, Driver experienced a breakout moment replacing into Signature Theatre Company’s acclaimed off-Broadway production of Angels in America. Driver played Louis Ironson opposite Michael Urie’s Prior Walter and Billy Porter’s Belize in the big revival helmed by Burn This director Michael Greif. He returned to Roundabout the following season co-starring in Man and Boy alongside Frank Langella. He ended his Roundabout revival trifecta with Look Back in Anger in 2012, which ran in their off-Broadway space and co-starred Keri Russell’s husband, Matthew Rhys. Burn This is his first major stage production since. Brandon began his career as a child actor as the Little Boy in the world premiere of Ragtime in Toronto. Later he toured as Mark in Rent before making his Broadway debut in 2011 as Beth Leavel’s son in the jukebox musical Baby It’s You!. His breakout role came in 2014 when he originated the role of composer Adam Hochberg in the premiere of the American In Paris stage adaptation in Paris. He reprised the role on Broadway in 2015 and received his first Tony nomination. He then starred as Mendel in the first Broadway revival of Falsettos in 2016, and a second Tony nomination followed. His incredible, heartbreaking, and funny performance is preserved on film, and always worth the watch. His next musical was MTC’s Hal Prince revue, The Prince of Broadway in 2017. In one evening, he showed his versatility, seamlessly going from She Loves Me to Cabaret to Kiss of the Spider Woman. After the limited run, Brandon gave a heartbreaking performance as in New York City Center Encores! 2018 revival of Grand Hotel as the fatally ill bookkeeper Otto Kringelein. Then he joined the Tony-winning Best Musical The Band’s Visit as Itzik. He left in February 2019 to make his non-musical Broadway debut with this scene-stealing performance as Larry in Burn This. David Furr made his Broadway debut in March 2004 as part of the large cast in Lincoln Center Theater’s King Lear starring Christopher Plummer. In December 2004, he was back on Broadway and at LCT in The Rivals. In 2005, David was the standby and eventual replacement for Nick in the Tony-nominated revival of Who’s Afraid of Virginia Woolf? starring Kathleen Turner and Bill Irwin. He then toured the production with them. In 2007, he played Guiderius in LCT’s revival of Shakespeare’s Cymbeline. In 2015, he reprised the role for The Public Theater’s Shakespeare in the Park production. David co-starred as Dickie Reynolds in Manhattan Theatre Club’s 2009 Broadway revival of Accent on Youth opposite Tony winner David Hyde Pierce. One of his most notable performances came in 2011, when he co-starred brilliantly as John Worthing in Roundabout’s hit Broadway revival of The Importance of Being Earnest. The production was filmed, so you can still take in his hilarious performance any time. David’s next two credits were off-Broadway. He played Orlando in the Shakespeare in the Park production of As You Like It in the summer of 2012. Then in the summer of 2013, he co-starred as Harry Percy in MTC’s comedy The Explorers Club. Then, in 2016, David received his first Tony nomination for his hysterical, physical featured performance as Garry Lejeune in Roundabout’s starry revival of Noises Off. Now three years later, he returns to the stage in Burn This. Don’t miss this trio of stars in ‘Burn This’ at Broadway’s Hudson Theatre.